Tyrone missed out on a place in the Division 1 League semi-finals as Diarmuid Connolly's injury-time point earned Dublin a dramatic win at Omagh. Dublin looked set to romp to victory as early goals from James McCarthy, Jason Whelan and Michael Dara Macauley helped them lead 3-3 to 0-3. But Tyrone trailed by only six at the break and Peter Harte's penalty helped the Red Hands draw level late on. But Connolly's point earned the Dubs - and not Tyrone - a semi-finals spot. A draw would have seen Mickey Harte's Red Hands progressing to the last four with Dublin missing out but Jim Gavin's side can now look forward to a semi-final meeting with Cork next weekend. The Division One title holders stunned their opponents with two goals inside the opening 70 seconds. First McCarthy charged through from deep to finish off a quick-handed move, smashing home off the underside of the crossbar. Less than a minute later, Whelan was the man who got on the end of another incisive move to slot the ball low past 'keeper Niall Morgan. The Red Hands picked themselves up off the floor and started to run at the Dublin defence, but their shooting was less than impressive, although Darren McCurry did slot over a couple of decent efforts. But Dublin struck for another goal in the 16th minute when Macauley drifted into space and rifled another shot past the helpless Morgan. Morgan pulled off an excellent save to deny Kevin McManamon, and Dublin's stand-in met-minder Sean Currie was also called into action, diving full length to save superbly from Sean Cavanagh. Tyrone did score the last three points of the half, all from placed balls, from McCurry and Morgan, but it was Dublin who took a 3-4 to 0-7 lead into the interval. And the home side chipped away at the deficit when Sean Cavanagh charged through for a point, and Morgan curled over a difficult free. Another long-range effort from the goalkeeper reduced the gap to two, but Dublin rallied again to hit the target through Alan Brogan and Philly McMahon. They could have had a fourth goal, but corner back Aidan McCrory got back to block McManamon's effort on the line. 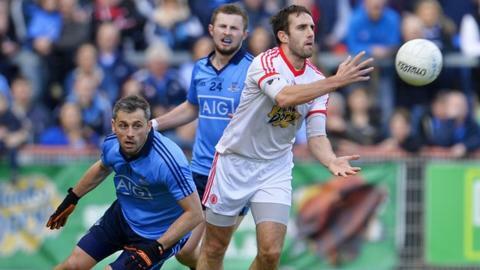 Tyrone cut Dublin's lead to 14 on 60 minutes when Harte netted his penalty after Shay McGuigan had been hauled down by Currie. The Dublin keeper appeared lucky to escape a black card for the transgression. However, Dublin were reduced to 14 men when full back Rory O'Carroll picked up a second yellow card, and Ronan O'Neill narrowed to a single point from the resultant free. The Red Hands continued to press, and on the stroke of 70 minutes, man of the match Mattie Donnelly brought them level with a long range effort. But Connolly popped up to swing his glorious long-range winner in stoppage time.